In its 85-year history, St. Therese of the Infant Jesus (Little Flower) Parish in Indianapolis has seen many of its young men discern vocations to the priesthood. In this Year for Priests, members of the Indianapolis East Deanery Parish have been learning about the sacrament of holy orders and paying tribute to priests who either have ministered in the parish or grew up in Little Flower. This catechetical program, which took place in January, is part of a broader initiative in which Little Flower parishioners are learning about all the sacraments. Bulletin inserts in January gave parishioners information about the priesthood. Letters in appreciation of priests from members of the parish were displayed in the parish church’s narthex. 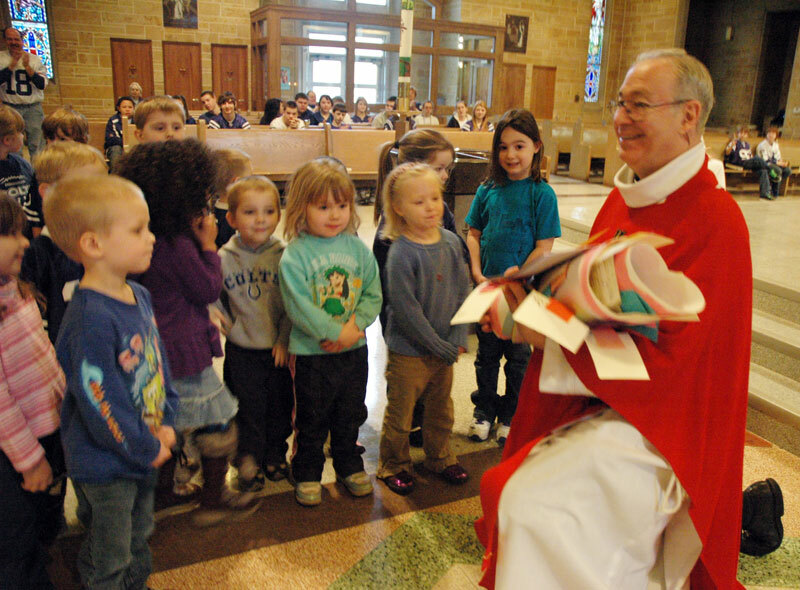 And during a Feb. 5 Mass, students in the parish’s preschool program presented Father Robert Gilday, the pastor of Little Flower Parish, a spiritual bouquet that was a visible sign for him of the many prayers that Little Flower School students offered up for him. Father Gilday is in a good position to appreciate the way in which Little Flower has nurtured priestly vocations over the years. He grew up in the parish in the 1950s and 1960s. “The parish was large,” he said. “The school was large. In many ways, my life as a child was very much centered on the school and this parish. So all of those things obviously factored into me becoming a priest. Other priests who called Little Flower Parish home include Comboni Father Michael Barton, Benedictine Father Bede Cisco, Father James Farrell, Father Joseph Moriarty, Father Paul Shikany, Maryknoll Father David Sullivan and Father Darvin Winters. Priests now deceased who grew up in Little Flower Parish include Father Donald Schmidlin and Msgr. Francis Tuohy. Those prayers are continuing to have an effect. Seminarian David Leszcynski, a freshman at Bishop Simon Bruté College Seminary in Indianapolis, is a Little Flower parishioner. He said that it was his involvement in parish liturgies and choirs, as he was growing up, that helped him nurture his faith and discern a possible priestly vocation. Tom Costello, 56, is a lifelong member of Little Flower Parish. For the past decade, he has served as the parish’s director of stewardship and parish administration. Costello also oversees the parish’s confirmation program. Although he is quick to acknowledge that there have been significant demographic changes in the parish in recent decades, Costello is confident that more young men at Little Flower Parish could follow in Leszcynski’s footsteps in discerning a vocation to the priesthood.